In Melbourne’s Central Business District, shops are interspersed with alleyways full of coffee-brewing cafés and colourful street art. Exploring the city’s best shops and street art is not only a unique treat for tourists but also a chance to learn about Melbourne’s history and heritage. Award-winning travel blogger Jayne Gorman walks us through the best places to find shopping and street art in Melbourne. Once you have finished browsing the fashion in Bourke Street head down Union Lane to browse some of the city’s brightest street art. The constantly changing graffiti in this alleyway makes the passage feel like an open-air museum. A similar effect has been created in Chinatown’s Croft Alley where the Croft Alley Project has been introduced to celebrate, showcase and sometimes sell the artists’ work. 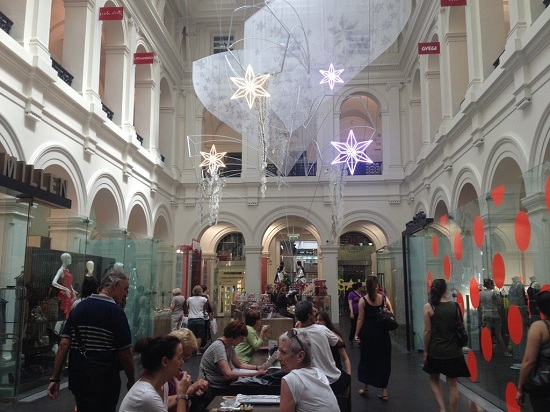 In contrast to this modern art The Block Arcade, an opulent 19th Century shopping arcade linking Collins and Little Collins Streets, offers the chance to reflect on Melbourne’s rich history. The arcade’s glass domed roof and mosaic floor are a tribute to the Galleria Vittoria in Milan, on which the Arcade was modelled. Points of interest inside the Arcade include the Hopetoun Tea Rooms, which were established in 1892 but still produce drool-worthy cakes today. Another of Melbourne’s unique arcades is a little harder to find. Campbell Arcade lies hidden underneath the road and links Flinders Station with Degraves Street. This subway hosts an eclectic range of retail stores, the acclaimed coffee of Cup Of Truth and various art installations. Look out for the vintage clothes at Subject to Change and take some time to browse Sticky Institute, a non-profit arts space dedicated to Australian and international zine culture. At the nearby Nicholas Building you can also get your fill of retro clothes at Retro Star, purportedly the largest vintage clothes warehouse in Australia. The Nicholas Building itself heralds from the 1920’s and has heaps of historical charm, as well as a rather unusual vintage haberdashery on the second floor. 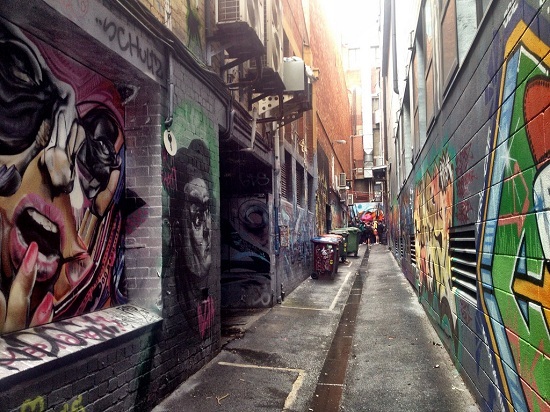 Degraves Street is a hotbed of street art and pavement cafes that line the pedestrianized area and the nearby Hosiers Lane is another alley of creative graffiti. Leaving the Central Business District (CBD) there is one last area I recommend you visit for a combination of shopping, street art and historical significance. The Queen Victoria Market is a Melbourne institution dating back to 1878. In the heart of the market you will find a mix of fruit, vegetables and household goods but it is the buildings around the edge that hold the most interest. 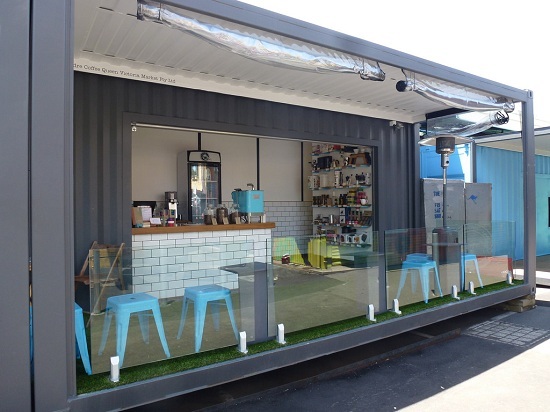 Look out for old storage containers turned into coffee shops and gift store Melbournalia – full to the brim with quirky souvenirs representing the unique shopping and street art found in this city. Once you've shopped to your heart's content, why not explore some of the breathtaking scenery and natural beauty that's just on Melbourne's doorstep? Our sale includes holidays in the Australian state of Victoria, which will take you to the vibrant city of Melbourne and beyond - take a look at what you could be experiencing here, and don't miss the chance to WIN a road trip from Melbourne with Visit Melbourne, Royal Brunei and Flight Centre UK.